“Make-believe” play is crucial to development for pre-school age children. Imaginary play helps children develop social skills and eye-hand coordination. It also encourages children to share and helps build a foundation for problem-solving skills. Not to mention, pretend play activities are also some of the most fun kids can have. Outdoor playhouses have been a quintessential part of countless childhoods for decades. And in an age where parents are trying to get kids to enjoy outdoor play instead of sedentary hours in front of the TV or glued to iPads, Playhouses are a better idea than ever. Playhouses are a favorite for parents seeking wholesome outdoor activities that aid in early development. But, with so many outdoor playhouses for kids out there, choosing the right one can be a challenge. 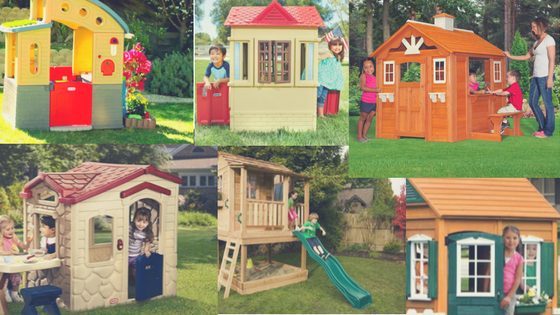 Things to think about when purchasing a playhouse for your child or toddler are age appropriateness, features you are looking for, materials it is made from, quality and overall ascetic on your property. Luckily for you, Everything Backyard has scrawled the depths of the internet in search of the best playhouses for kids and toddlers. With a large and open window design, the Step2 Neat and Tidy II Playhouse is great for parents who want to work out in the yard while their children play. The house features a seat in the kitchen, a play phone, table, clock, faucet, shelves and floor complete with water-drain holes. The shutters also open and close on the house. The exterior has nice tan and burgundy colors that complement most home colors unlike the bright eye-sore playhouses of the early 1990s. The mailbox and flower box on the outside complete the quaint cottage look of this children’s playhouse. *House comes in “Cottage-pink”* as well. Features: Realistic home features like faux stone and wood that can complement your own home, 2 AAA batteries required to make kitchen more life-like, roomy interior allows even some adults to sit inside with children, can “survive the elements” even through rain and winter weather. 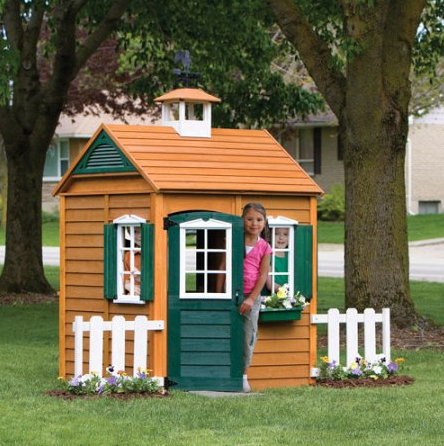 Kids and parents alike will love the rustic charm of the summer cottage wood playhouse. With the real cedar wood paneling, faux-chimney and flower boxes; the ascetic perfectly pairs with the concept of many backyards. Children seem to love the “home-security” of the magnetic door latch, the creative play possibilities with authentic-looking kitchen, and exterior side snack station with a bench. The panelized construction makes parent setup a breeze and you’ll feel reminded of traveling to an enchanting lakeside cottage each time you watch your toddlers or kids playing. Features: Charming real wood cottage is weatherproof but could be okay indoors as well, kitchen equipped with a sink and stove make playtime feel magic, and outdoor bench at a snack window is a great place for children to sit and relax. This classic playhouse is the perfect place for toddlers to play. The house features 2 windows and 2 working doors and is lightweight enough that it can easily be moved indoors or outdoors. The nice tan color also can look lovely in most yards. The cape cottage playhouse also has mail slots and flag holders. Features: The home has a tan faux-brick facade, opening and closing windows and doors on opposite sides, and serves as a great make-pretend home for younger children. The mail slot is sure to be a hit with youngsters, too. 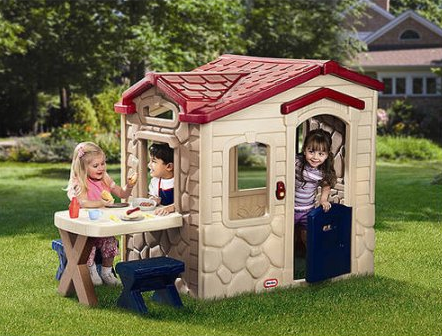 The Picnic on the Patio playhouse is perfect for toddlers and young children hungry for learning. 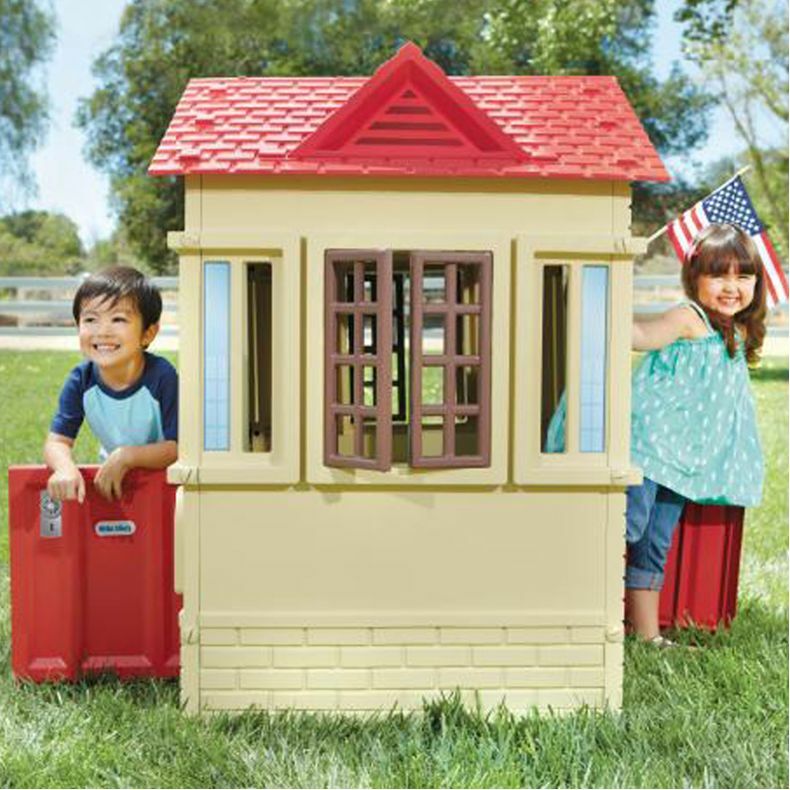 Both durable and highly-functional, this play house stands in a league of its own with a lifelike kitchenette, great outdoor seating place for playing with children, battery-powered noises that toddlers adore, and comes with play accessories that most other houses require you purchase independently. The realistic siding and stone construction will compliment most existing backyard styles as well as your real home. Features: The pretend kitchen features burner, oven, cupboards and a (non-sticker) fireplace. The doorbell makes 6 different noises that are a hit with young children. The outdoor seating is a great place for children to throw make-believe dinner parties as they imitate real life and develop social skills. The color of strawberry shortcake, the Sweetheart Playhouse is a very sweet play home for toddlers and young children. 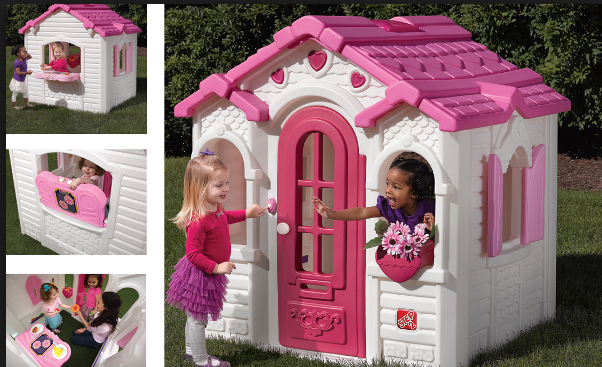 Although most real houses don’t usually have pink roofing or shutters, other elements of the Sweetheart Playhouse are very realistic. For instance, the doorbell and phone make noises with batteries. The house also has very cute details children will adore such as a table top that can flip over to become an outdoor pretend barbecue. Features: 4 AAA batteries help power the electronic phone and doorbell that children love. The indoor table top converts into an outdoor grill with knobs you can turn so children can have hours of make-believe grilling for their friends. The shutters open and close, there are flower boxes that add a cute element of style, and a clock inside has movable hands. It’s never to early to start teaching children eco-friendly habits. The Go Green! Playhouse is the perfect way to incorporate real life lessons into your toddler or young child’s play time. This playhouse has more features than your everyday run-of-the-mill plastic house. This one has activities that will teach kids the importance of recycling, conserving and respecting the planet. Plus, this playhouse comes with accessories that will help them do real activities like gardening that has never been done in traditional playhouses. Features: Made from 10% recycled plastic, LED lights powered by solar panels, removable recycling bins teach kids how to help out at home, roof opens up for ventilation but also has a small section that can be p;anted to grow grass and become a living roof, water reservoir can be collected for a working pump sink. Comes with shovel, rake and watering can. It also has a working phone and stove knobs so it has the great features of traditional play kitchens. 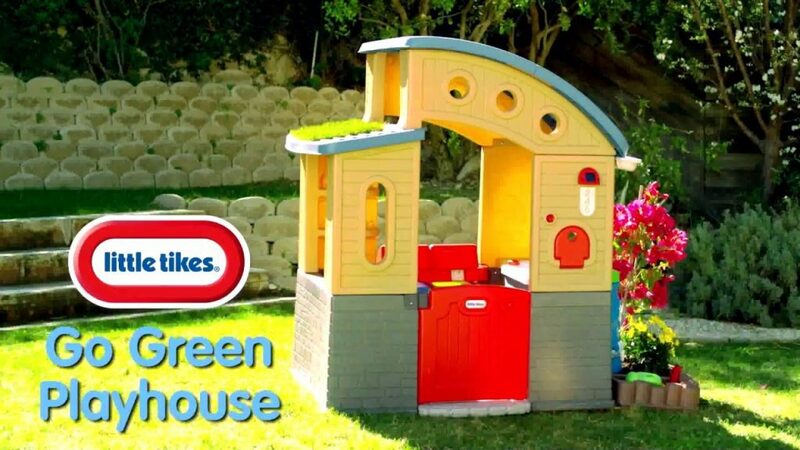 Your toddlers and children will feel just like mommy or daddy when they step into this very realistic playhouse. Details such as two large bay windows, a skylight in the roof, full kitchen, doorbell chime, cordless phone and welcome mat make this toy house a magically place for kids to make-believe. However, this house is a little pricey compared to other similar houses on the market. But, some would argue that this spacious children’s retreat is well worth the cost because of it’s high quality and easy assembly. Features: House requires 4 AAA batteries so that the cordless phone and doorbell can be interactive, kitchen features lots of details such as storage cabinet, skylight in roof allows natural light in, welcome mat, dutch door, large cabinet under a range and sink, shutters that open and close. 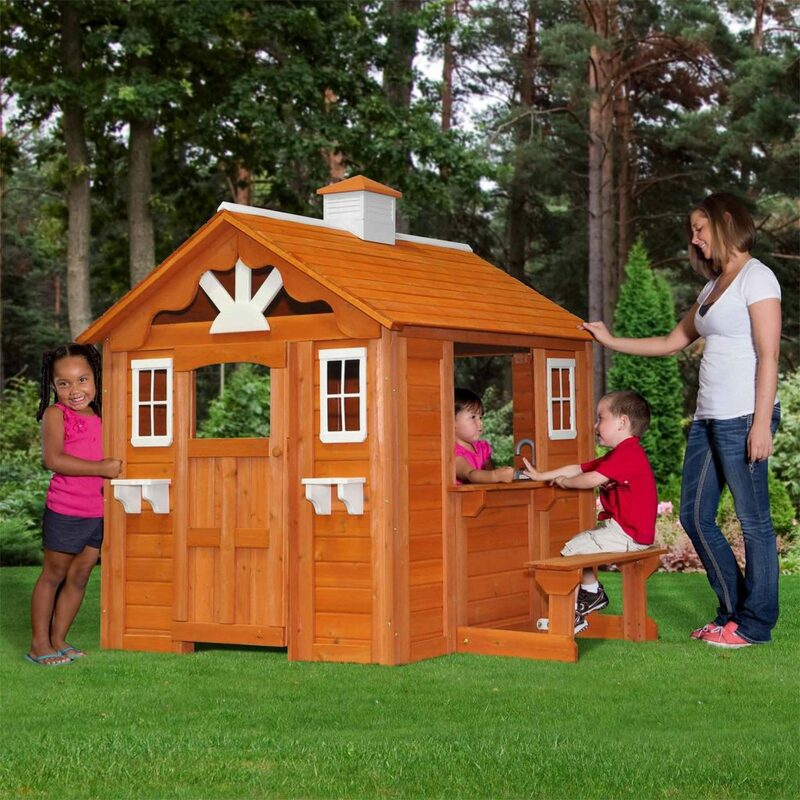 This charming wooden playhouse is a gorgeous outdoor accent for your yard and a spectacular place for your young children to have imaginary play time. The playhouse features three window boxes equipped with flower boxes. This means a child can add some of their creative flair by adding curtains or flowers if desired. Although this playhouse has charms reminiscent of classic treehouse without the danger factor, the price is a little steep. 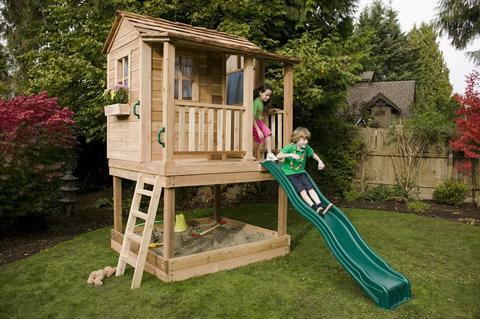 Plus, the playhouse does not come with the sandbox, slide, or ladder as pictured. Features: Playhouse is made from lightweight but durable Western Red Cedar, has three window openings with flower boxes, optional sandbox and slide can add to the fun. This beautiful stunning playhouse will provide children with countless hours of interactive play. Plus, you won’t need to sacrifice personal garden style with tacky plastic. The playhouse features cute details that make the home feel warm and cozy such as a charming white picket fence, shuttered windows and a flower box. All you need is to pick some fresh flowers for the box and add your own touch of color to the quaint children’s retreat. Up to three children came comfortably play inside this playhouse at once so it would make your backyard a playdate favorite. Features: Cafe table in the back of house, decorative white picket fence, flower box on front window, made of premium cedar lumber and weather resistant. This playhouse has more to offer than your average make-believe house with a swing set, slide, picnic bench, step ladder, play deck and even a rock climbing wall. Constructed of all cedar, the playhouse also features a colorful rooftop that compliments the colors of the slide and swings. 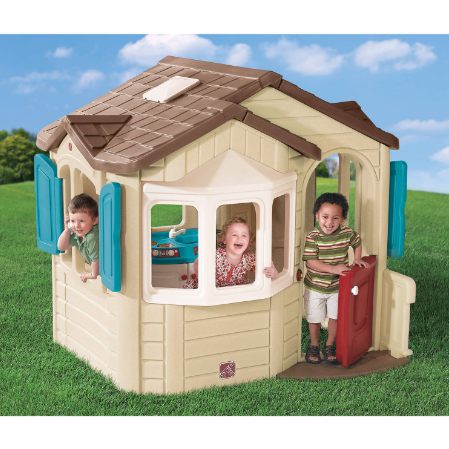 This play house is a great option for the money because the play area can grow with the kids over the years. For parents that have large yards, this option turns your back lawn into a playground right at home. 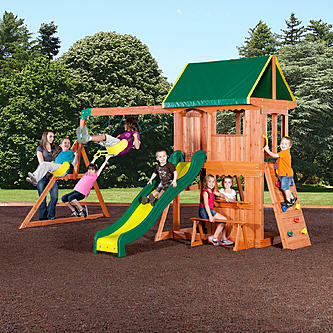 This beautiful traditional play set will provide children with countless hours of leisure. Features: The playhouse is constructed from all cedar wood, colorful green and yellow canvas canopy coordinate with the 8 ft long slide and two swings, upper deck can be accessed by either a standard step ladder or a challenging rock wall, and there is even a snack window and bench for children to relax on.